Dates, the fruit of the date palm, are most often associated with, and grown in, the arid deserts of the Middle East. But they also grow in the arid deserts of California, where the growing season ends right around now, which means it is a good time to eat some dates. There are many good and proper ways to eat dates; they are a versatile food. A bad way to eat dates — a common way, according to food blogs and the shithead gourmet grocery store half a block away at which I purchase more of my food than I’m really comfortable with, is to make them into a greasy, sticky, testicular blob called an “energy ball,” which is theoretically a replacement for a granola bar or energy bar, but is just a blob of dates smashed together with cacao, coconut, flax, and maybe some kind of all-natural alterna-nut-butter. An energy ball is a food which should not exist. It is an insult to the date, which is, very literally, a sacred crop; the Old Testament lists it as one of the Seven Sacred Species that sustained the Jews while they lived in a nice place with a good climate. It is in the BIBLE. Please do not blend it with foul-tasting hippie foods such as raw cacao or goji berries or chia seeds. Treat it with respect. It is a mystical sustaining food, naturally possessing a sugar content and texture unlike anything else on the planet. It is not a plaything for raw foodists or those unfortunate souls in the Church of Paleo. The date grows in giant clumps on the date palm, and ripen right there on the tree. There are several different cultivars, which all produce dates that feel and taste differently, but farmers can also create different textures and flavors by choosing when to pick the fruit during the natural ripening process. 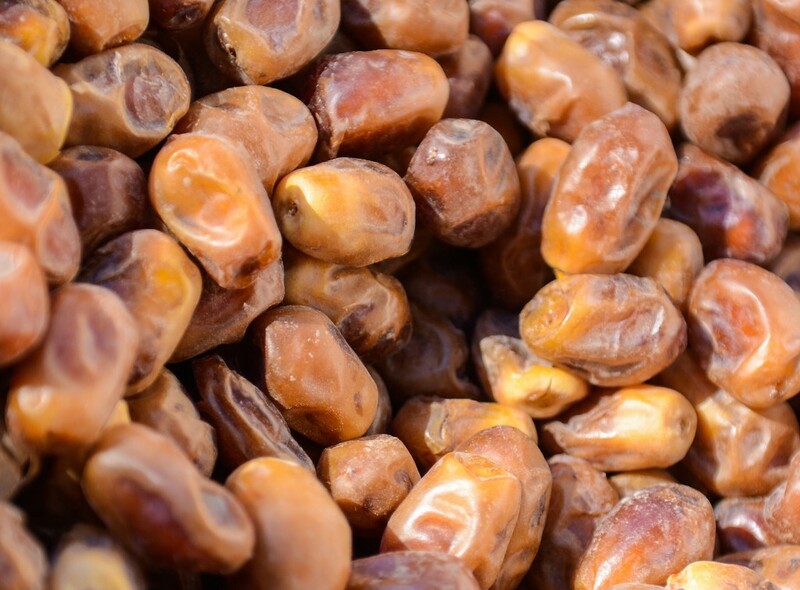 Dates, though they look like they belong in the dried fruit aisle, hobnobbing with the apricots and prunes, are not really in the same category. They dry right on the tree, rather than undergoing the extreme artificial dehydration that befalls the true dried fruits, and so retain quite a bit more moisture — which is why they need to be refrigerated, and have a shelf life shorter than, say, dried apricots. But, they also don’t require any preservatives whatsoever; if the ingredients list on your package of dates says more than “dates,” put them down and walk away. In this country, we mostly see two kinds of dates: deglet noor, which are firm and pale tan, and medjool, which are larger, wetter, squishier and a deeper, darker brown. The flavor is slightly different; deglet noor is slightly nutty, medjool more intensely sweet, like burnt sugar. Both may have a large-ish pit in the middle, which is tooth-crackingly hard and inedible (deglet noor are often pitted, while medjool hardly ever are). Neither of them, to be honest, are good for snacking; they are both somewhere around eighty percent sugar by weight, which if you ask me is way too sweet to be eaten alone. But that sweetness gives them a unique culinary attribute: They are basically a robustly flavored sugar cube. Given that dates are sold in all stages of ripeness, there are different things to look for when buying them. If you’ll be using them whole, I prefer deglet noor; they’re not quite as cloyingly sweet, and, being a bit on the dry side, are easier to work with (especially for stuffing). Actually, if you’re planning on chopping them for use in a salad, I prefer deglet noor too. Medjool are ideal if you plan on blending or food processing; they turn into what looks like a dark brown honey. Dates are hugely important in a few different cuisines, especially Persian, Moroccan, Spanish, Tunisian, Syrian, and, um, Southern Californian. Often they are paired with savory elements, especially nuts and fatty meats like lamb. It can be hard to cook with them in a purely vegetarian dish; they are so powerfully sweet that they need that savory flavor to balance them. That said, I have one recipe in here that ignores balance entirely; it is sweet + sweet + fat, and it is crazy good. This is a traditional recipe from…southern California, where some date farmers invented it as a way to convince Americans that this weird wrinkly dried oblong thing actually has enough sugar in it to kill a station wagon full of diabetics. They typically use deglet noor dates, but I like the darker, stronger medjool for this one. Pit the dates, then chop them — about a cup’s worth. Dump into a blender or, less ideally, a food processor, with a cup of milk (whole milk is best; milkshakes are one of those things where trying to remove fat just leaves you with garbage). Blend until smooth. Add a cup of vanilla ice cream, a sprinkle of cinnamon and a sprinkle of salt. Blend more. That’s it. Drink it. Cook rice (or quinoa, or couscous), and let it cool. Throw it in a big bowl, bigger than you think you need. Chop a handful of almonds into smaller-than-unchopped-almond pieces, and throw those in too. Crumble in a handful of feta cheese, then coarsely chop about the same amount of dates as cheese and throw all that in. Chop radishes into chunks (not slices) and add to the bowl. Add in several big pinches of za’atar. If you can’t find za’atar, use a mixture of dried oregano to dried thyme to toasted sesame seeds in a ratio of 2:2:1 and use more lemon juice. Oh yeah, squeeze in like a whole lemon’s worth of lemon juice, and a few big glugs of olive oil. Mix thoroughly, add salt to taste. If it’s too sour, add more dates, almonds, and/or oil. Too sweet, add more cheese, lemon juice, and/or salt. Top with chopped parsley. This recipe comes to us from Crop Chef Pal Nozlee Samadzadeh, albeit accidentally; I had read and subsumed this recipe awhile ago, thought of it as a fantastic alternative to the tasty but sort of expected bacon-wrapped stuffed dates, and had no idea it originated from her. Luckily Nozlee was nice enough to add a few suggestions to the already published recipe. Any dates will work for this — Nozlee says even the stickiest of medjools are acceptable. Chop walnuts into a couple pieces per walnut half, put them in your little toaster oven tray and toast until golden and fragrant, just a few minutes. Don’t burn them!!! Get a pan on the stove, add in a good glug of olive oil over medium heat. Halve the dates, take out the pits if they’re there, and throw them in the pan. Cook for a couple minutes on each side and remove. On a plate, spread a whole bunch of yogurt. Full-fat Greek yogurt is the best for this; use Fage, not other, inferior brands. If you want, you can strain the yogurt first using the method outlined here. I call this strained yogurt labneh; Nozlee calls it “mast e seft,” but it’s basically the same thing. Scatter the fried dates over this yogurt, sprinkle them with flaky salt like Maldon, and pour olive oil over the top. Nozlee recommends that you “add more olive oil than is sensible.” Top with the toasted walnuts and a pinch of sumac, if you have it. Sumac is a purple spice that, I swear, is not poisonous; it tastes bizarrely like lemon juice. If you don’t have sumac, squeeze lemon juice over the top. Serve with crusty bread. Dates are referred to, by marketers and desperate parents alike, as nature’s candy. In my opinion nature offers many different candies; have you ever had, like, a really good peach? You idiot? They are better than candy. But the comparison works because dates are luxurious and unhealthy and pocket-sized, gooey sugary sticky treats that if you are anti-candy you can indulge in while thinking of your diet as all-natural. But they go beyond candy; they are an intense way to add a powerful hit of sweetness to any dish, and are worthy of your purchase. Eat the date.